Most people picture Sri Lanka as an island with pristine beaches and turquoise waters. While that is true, this distinctive island has so much more depth and richness owing to more than 3,000 years of documented history. It’s an exciting time for this tiny island nation that sits in the Indian Ocean southwest of the Bay of Bengal. Sri Lanka – formerly Ceylon – has recently emerged from several decades of unrest. A rush of new developments in both rural and urban centers across the island attract the attention of international travelers – as they should. Sri Lanka is home to eight UNESCO World Heritage Sites that include some of the world’s oldest cities. Marco Polo visited Sri Lanka in 1292 and reported the island of Ceylon is “… the finest island in the world, and from its streams comes rubies, sapphires, topazes, amethyst and garnet.” Known as the “Jewel Box of the Indian Ocean,” Sri Lanka, has yielded precious stones and fine gems in a great profusion. The Kingdom of Anuradhapura is Sri Lanka’s third and the longest serving capital and one of the oldest continuously inhabited cities in the world. It is also one of the most sacred cities for Buddhists. Sigiriya is a fifth century fortress with a water garden that displays futuristic elements of landscaping in tandem with some of the oldest recorded murals in the country. Polonnaruwa, the second most ancient kingdom of the country, was known for superior irrigation systems that continue to irrigate farms in the region today. Digamadulla, the Eastern kingdom of Sri Lanka, was the agricultural and spiritual capital of the island during the Anuradhapura Kingdom. Sri Lanka’s last kingdom – the Kingdom of Kandy – was destroyed three times by the invading Portuguese; however, Kandy still has preserved houses, palaces and temples dating back nearly five centuries. The country’s 24 parks support wildlife including elephants, leopards, sloth bears and deer. Reptiles such as vipers and crocodiles are also present as well as more than 400 species of birds. Sinharaja Rainforest and Peak Wilderness Sanctuary, in particular, offer exceptional bird watching opportunities. In addition, tea plantations, rubber tree forests and rice paddy fields reveal the focal point of the agricultural life of rural villagers. 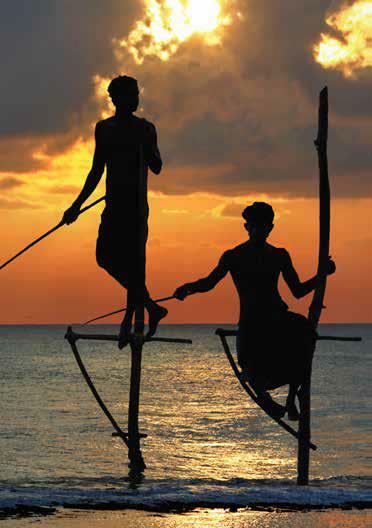 With so much to see and experience, Sri Lanka offers the traveler so much more than just a day at the beach.